Sometimes writers indulge in what I like to call Where's Waldo-ing: the act of hiding little aspects of oneself away in fiction. There are many ways to go about this, but today we're going to focus on setting--specifically, where the story takes place. How about a few famous examples? Janet Evanovich was born in New Jersey. Her bestselling Stephanie Plum series takes place in New Jersey. PC and Kristin Cast live in Tulsa, Oklahoma. Their bestselling House of Night series takes place in Tulsa, Oklahoma. Rachel Gibson lives in Idaho. Many of her books take place in Idaho. Include some details. What do you know, as a resident, that other writers won't be able to grasp from afar? What does the area smell like? What's the weather like in April? How diverse is the community? What slang is used? What kinds of jobs are available there? But not all of them. Don't give a shout-out to that little family-run coffee shop on the corner. By the time your book's in print, it could be out of business. If you're writing about a certain city/town, you want to be as authentic as possible... for as long as possible. Be vague, if you have to. If all else fails, make stuff up. You know where STRENGTH takes place? Wilcox, Ohio. "But Carrie, there is no Wilcox, Ohio..." Exactly. In my made-up college town, I can incorporate all of my local experience, without the restriction of a predefined area. I get to map out every school, every shopping mall, and nothing will change--unless I say so. (Seriously. I made a map.) There's a lot of freedom in this option, but you'll still want to keep things grounded in reality. For example, I placed my made-up town in NE Ohio, but mentioned its proximity to other, real cities, like Columbus. What about you guys? Ever written about somewhere you live/have lived? Have any tips to add? I've had a battle deciding where to set my WIP, and I settled on a big city near to where I live. The good thing about that is that it feels like I'm writing something I know about, but putting in my own little twists. I very nearly wrote a fictional town in the area, and actually, it still could happen. While I am still writing, the destination isn't as important as the fact that I know it's a city and I know how it looks in my head lol! I like that - Where's Waldoing! Haha. I definitely do that. I think I can't help it. There's always a piece of me somewhere, either in my characters or in the setting or both. I don't create any characters to BE me, but there are pieces of me there. And, come to think of it, pieces of other people in lives also. One WiP takes place on Long Island where I grew up. There are some real places (Jones Beach, Hempstead Turnpike, Nassau County jail, though I've never been there) and some made up places. Another one takes place in a totally fictionalized town in rural New York, similar to where I live now....Where's Waldo, indeed. I think the key is to provide enough flavor that anyone will be able to draw a reasonable picture in their own mind of what it's like, even if they've never been there before. Less is more is good advice, I think. My characters tend to have some minute details that I have. Like the MC in my book under submission has a heart-shapped face with a widows peak like me. Just small things like that. My co-written MS takes place in NYC, my hometown. But, the characters also travel to Vegas. In my two new works, it takes place in Phoenix, then moves to Calgary, and the other one takes place in Washington D.C. The Phoenix and Calgary settings were tough because I've never been to either of these places. But, some Waldos do show up in character traits, phrases used, etc. Write what you know, right? I like to write about small towns AND big cities, but I prefer to live in small towns. It's amazing where your mind will take you even if you never want to GO there in real life. Ha! I love it. I especially love adding your own made up part of the world to what you already know. Brilliant idea! Especially if I get to make my own map. Yes, I think that would be extremely fun! One of my projects is set in Scottsdale, AZ , where I used to live, and I've avoided mentioning too many businesses. I do have some landmarks mentioned (like Scottsdale Fashion Square which is a ginormous mall that probably isn't going anywhere and Sky Harbor, the airport.) but I tried to avoid being like, "Oh, we went to that Starbucks on the corner of Indian School and Scottsdale Rd," because who knows how long it'll actually be there. I mean, it's been over a year since I've been in that neighborhood, it could be gone already! Stuff is always moving and shutting down. I have made up a town in a real area however. That's lots of fun. I love the freedom. There are a few places in all of the books I've written. It'll be interesting to see if you guess the ones in my MS when you (finally) get to read it. I wrote a book (that will never see the light of day) that in essence, explained why an area by where I grew up (that was always a mystery to us) was the way it was. In my current book, it's a big ole no. Unless you count the fact that I "visited" it through google maps. But... then I blew it up with a gigantic bomb, fast forwarded a few decades, and put new people living there. I love when authors use made up towns in real states, and make it like a town would be in that state. It's my favorite way to go! 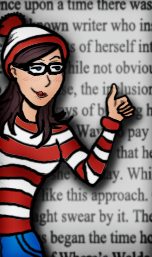 I've done a few Waldo settings. It's fun to play with places you know, throw in new things and the like. Most of my stuff takes place in different times, though, so there isn't much similarity. But sometimes I throw in something anyway. Love the whole idea of including setting details many people wouldn't know just by glancing at Google maps. Great post! I was just about to say I've never lived on a Ringworld, or on another planet fifteen thousand years into the future. Then I remembered, one of my WIPs starts off in a near-future climate-ravaged Oxford University, and I include a few geographical details along the way. Hold Still is the first time I've written about somewhere I actually live. I just love making up towns. That's the very best. Unfortunately most of my books are set in large urban areas and it feels weird to make up a large city. I think a small to mid-sized town is fine but I always feel like people won't find it believable if I make up a whole city! And by the way, pretty much all writers get Philly wrong. I don't know if it's them lying about actually having lived here or if they edit the odd details out! I always write about places I've lived. Helps that I've lived a lot of places...and I love revisiting them mentally. And when I need an update, Google earth is awesome. Great post! I'm like you when it comes to this. I make up a city and place it near one people are familiar with. I make my own maps, too. Recently, wrote a zombie short story (my characters made me do it) based in St. Louis, MO, though I don't live there. I used Google earth like some of the other writers. It allows you to zoom in and pan around as if standing on the street. Great post! I love taking an existing city and adding hidden layers to it. By the way, did you see the award I gave you the other day? I completely forgot to tell you. D'oh! I love a mix of real and made up places! Oh, cool! I'll be sure to head on over! I have written a novel that takes place in my town now, but part of it took place in NYC (where I also lived) but I had to research some places because I'd never been there, like the NY public library. That was weird! I've written (counting on fingers...) 6 novels and all but one takes place in my hometown or home province or at least Canada. I remember when my second novel came out and a reviewer mentioned how much he enjoyed reading about his town in my books. He said it was the reason he bought the book in the first place. Reading what he wrote reminded me that readers really are real people. As opposed to unreal people. Oh, I definitely have! Sometimes on purpose, sometimes... not. Hi. I saw your name in the Platform Building Campaign, and thought "I recognize that name! She's one of my Twitter followers, and I'm one of hers!" Nice to read your blog. As for Waldo, I have put some bits of Montreal (where my wife lived) into a story I have not published, and I placed my story, Sam, the Strawb Part, in Ottawa, but I have few details. I have never been to most of the setting of my first published novel, The Bones of the Earth. What I do like to do is put people I know into my stories as characters. I'm hoping that someday, one will say "is that supposed to be me?" This is very true. ;) Oh yes. I love the freedom, too! Oo, which part of the Midwest? :D I do that, too. Fragments of memories, elements here and there. Good stuff! Fun, isn't it? :D Thanks for stopping by, JEFritz! Hold Still felt (from what I've read) so flippin' real, though! It had the city vibe down. Seriously. :) Good point about making up a large city. That would be pretty hard to pull off! Hah! I love that your characters made you do it. Perfect excuse! Oh yes. Google Earth is fantastic. Thanks, Lori! Oo, layers. I love that. :D Hi! It sounds like a nice mix of places. By the way, I love that title (The Bones of the Earth). I'll have to check it out! Hi Carrie, I'm making my way through the YA group slowly but surely! I'm tickled pink that you mention PC Cast and Tulsa, Oklahoma because I live in Tulsa! PC Cast was a friend's art teacher in grade school, and she was also one of my husband's clients when he worked at one of the local craft stores. She came in off and on to have her book covers framed :). Sadly, that was before he and I were dating, and so I've never met her. And settings . . . well, I typically write fantasy, so I've never actually had something take place somewhere that actually existed. I think if I ever wrote something set in this world, though, I would have it be set somewhere I've lived and/or visited so that I could make it realistic. I know the feeling, Rebekah. It's quite the daunting task!